In 2004 Fort Greely, Alaska, became the first launch site for the anti-ballistic missile Ground-Based Interceptors of the United States' Ground-based Midcourse Defense system. The 260,000-hectacre site was located 160 km southeast of Fairbanks, 16 km south of the town of Delta Junction. First Launch: 1966-02-02. Last Launch: 1972-05-22. Number: 397 . Location: Delta Junction, Alaska. Longitude: -145.74 deg. Latitude: 63.93 deg. Apogee: 387 km (240 mi). The camp was established in 1942 as Big Delta Army Air Field (later called Allen AAF), a landing and refueling base for aircraft and supplies being flown to the Soviet Union. After the war, the remote location and arctic location made the site suitable for a number of 'special uses'. 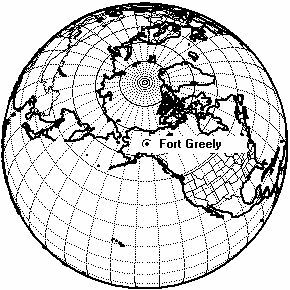 From 1955 the Army began using Fort Greely as a cold weather training and testing facility. Between 1962 and 1973, the Army operated the SM-1A 20-megawatt nuclear reactor at the site, capable of producing more than 1,600 kilowatts of electrical power. The stated purpose of the reactor was to evaluate the use of nuclear power reactors under adverse weather and geographic conditions. In 1966 the site began its career as a testing ground for biological and chemical weapons. It was also known to have been used for 363 suborbital launches from 1966 to 1972, reaching up to 85 kilometers altitude. In 1995 Fort Greely was selected for closure as a cost-saving measure. However, on 13 December 2001, the United states announced that it would withdraw from the ABM Treaty. Fort Greely was selected as the initial site for the Ground-based Midcourse Defense system. The decision was based on its location, which allowed interceptor missiles stationed there to intercept ballistic missiles targeting the continental United States coming from North Korea, China, Russia, and Iran. The remote site also offered seclusion and privacy; existing facilities and infrastructure; and stable geology, providing an ideal environment for underground missile launchers. Work began on the site in June 2002 on the first six 24-m-deep underground steel missile silos. New support facilities and infrastructure were also built, lined with reinforced steel to protect against high-altitude nuclear blasts. Over five kilometers of concrete tunnels connected the missile silos, control center, and storage facilities to allow operations in any weather. It was planned that a total of 25 to 30 anti-ballistic missiles would be deployed at Fort Greely by 2010. Fort Greely 5 inch gun HARP 5-inch Gun. Country: USA. Launch Vehicles: Arcas, Rocketsonde, GBI. Launch Sites: Fort Greely 5 inch gun. Agency: US Army. 1966 February 2 - . 20:17 GMT - . Launch Site: Fort Greely. Launch Vehicle: Arcas. Arcasonde 1A Weather mission - . Nation: USA. Agency: MRN. Apogee: 60 km (37 mi). 1966 February 3 - . 20:00 GMT - . Launch Site: Fort Greely. Launch Vehicle: Arcas. 1966 February 4 - . 20:00 GMT - . Launch Site: Fort Greely. Launch Vehicle: Arcas. 1966 February 5 - . 20:00 GMT - . Launch Site: Fort Greely. Launch Vehicle: Arcas. 1966 February 6 - . 20:00 GMT - . Launch Site: Fort Greely. Launch Vehicle: Arcas. 1966 February 8 - . 00:30 GMT - . Launch Site: Fort Greely. Launch Vehicle: Arcas. Weather mission - . Nation: USA. Agency: MRN. Apogee: 60 km (37 mi). 1966 February 8 - . 20:00 GMT - . Launch Site: Fort Greely. Launch Vehicle: Arcas. 1966 February 10 - . 20:00 GMT - . Launch Site: Fort Greely. Launch Vehicle: Arcas. 1966 February 11 - . 20:12 GMT - . Launch Site: Fort Greely. Launch Vehicle: Arcas. 1966 February 14 - . 20:00 GMT - . Launch Site: Fort Greely. Launch Vehicle: Arcas. 1966 February 15 - . 20:00 GMT - . Launch Site: Fort Greely. Launch Vehicle: Arcas. 1966 February 16 - . 20:00 GMT - . Launch Site: Fort Greely. Launch Vehicle: Arcas. 1966 February 17 - . 20:00 GMT - . Launch Site: Fort Greely. Launch Vehicle: Arcas. 1966 February 18 - . 20:34 GMT - . Launch Site: Fort Greely. Launch Vehicle: Arcas. 1966 February 19 - . 05:09 GMT - . Launch Site: Fort Greely. Launch Complex: Fort Greely 5 inch gun. Launch Vehicle: HARP 5-1. G01 - . Nation: USA. Agency: HARP. Apogee: 61 km (37 mi). 1966 February 19 - . 16:07 GMT - . Launch Site: Fort Greely. Launch Complex: Fort Greely 5 inch gun. Launch Vehicle: HARP 5-1. G02 - . Nation: USA. Agency: HARP. Apogee: 61 km (37 mi). 1966 February 19 - . 20:00 GMT - . Launch Site: Fort Greely. Launch Vehicle: Arcas. 1966 February 20 - . 00:00 GMT - . Launch Site: Fort Greely. Launch Complex: Fort Greely 5 inch gun. Launch Vehicle: HARP 5-1. G03 - . Nation: USA. Agency: HARP. Apogee: 20 km (12 mi). 1966 February 20 - . 03:00 GMT - . Launch Site: Fort Greely. Launch Complex: Fort Greely 5 inch gun. Launch Vehicle: HARP 5-1. G04 - . Nation: USA. Agency: HARP. Apogee: 20 km (12 mi). 1966 February 20 - . 04:31 GMT - . Launch Site: Fort Greely. Launch Complex: Fort Greely 5 inch gun. Launch Vehicle: HARP 5-1. G05 - . Nation: USA. Agency: HARP. Apogee: 61 km (37 mi). 1966 February 20 - . 20:00 GMT - . Launch Site: Fort Greely. Launch Vehicle: Arcas. 1966 February 22 - . 20:00 GMT - . Launch Site: Fort Greely. Launch Vehicle: Arcas. 1966 February 23 - . 00:00 GMT - . Launch Site: Fort Greely. Launch Complex: Fort Greely 5 inch gun. Launch Vehicle: HARP 5-1. G06 - . Nation: USA. Agency: HARP. Apogee: 20 km (12 mi). 1966 February 23 - . 20:00 GMT - . Launch Site: Fort Greely. Launch Vehicle: Arcas. 1966 February 24 - . 03:00 GMT - . Launch Site: Fort Greely. Launch Complex: Fort Greely 5 inch gun. Launch Vehicle: HARP 5-1. G07 - . Nation: USA. Agency: HARP. Apogee: 50 km (31 mi). 1966 February 24 - . 07:00 GMT - . Launch Site: Fort Greely. Launch Complex: Fort Greely 5 inch gun. Launch Vehicle: HARP 5-1. G08 - . Nation: USA. Agency: HARP. Apogee: 60 km (37 mi). 1966 February 24 - . 17:38 GMT - . Launch Site: Fort Greely. Launch Complex: Fort Greely 5 inch gun. Launch Vehicle: HARP 5-1. G09 - . Nation: USA. Agency: HARP. Apogee: 20 km (12 mi). 1966 February 24 - . 20:38 GMT - . Launch Site: Fort Greely. Launch Complex: Fort Greely 5 inch gun. Launch Vehicle: HARP 5-1. G10 - . Nation: USA. Agency: HARP. Apogee: 43 km (26 mi). 1966 February 24 - . 23:55 GMT - . Launch Site: Fort Greely. Launch Complex: Fort Greely 5 inch gun. Launch Vehicle: HARP 5-1. G11 - . Nation: USA. Agency: HARP. Apogee: 40 km (24 mi). 1966 February 25 - . 01:33 GMT - . Launch Site: Fort Greely. Launch Complex: Fort Greely 5 inch gun. Launch Vehicle: HARP 5-1. G12 - . Nation: USA. Agency: HARP. Apogee: 45 km (27 mi). 1966 February 25 - . 20:10 GMT - . Launch Site: Fort Greely. Launch Complex: Fort Greely 5 inch gun. Launch Vehicle: HARP 5-1. G13 - . Nation: USA. Agency: HARP. Apogee: 42 km (26 mi). 1966 February 26 - . 20:00 GMT - . Launch Site: Fort Greely. Launch Vehicle: Arcas. 1966 February 27 - . 20:00 GMT - . Launch Site: Fort Greely. Launch Vehicle: Arcas. 1966 February 28 - . 22:30 GMT - . Launch Site: Fort Greely. Launch Vehicle: Arcas. 1966 March 3 - . 00:00 GMT - . Launch Site: Fort Greely. Launch Complex: Fort Greely 5 inch gun. Launch Vehicle: HARP 5-1. G14 - . Nation: USA. Agency: HARP. Apogee: 41 km (25 mi). 1966 March 3 - . 01:00 GMT - . Launch Site: Fort Greely. Launch Complex: Fort Greely 5 inch gun. Launch Vehicle: HARP 5-1. G15 - . Nation: USA. Agency: HARP. Apogee: 42 km (26 mi). 1966 March 3 - . 02:00 GMT - . Launch Site: Fort Greely. Launch Complex: Fort Greely 5 inch gun. Launch Vehicle: HARP 5-1. G16 - . Nation: USA. Agency: HARP. Apogee: 45 km (27 mi). 1966 March 3 - . 03:00 GMT - . Launch Site: Fort Greely. Launch Complex: Fort Greely 5 inch gun. Launch Vehicle: HARP 5-1. G17 - . Nation: USA. Agency: HARP. Apogee: 45 km (27 mi). 1966 March 3 - . 21:03 GMT - . Launch Site: Fort Greely. Launch Complex: Fort Greely 5 inch gun. Launch Vehicle: HARP 5-1. G18 - . Nation: USA. Agency: HARP. Apogee: 61 km (37 mi). 1966 March 3 - . 22:01 GMT - . Launch Site: Fort Greely. Launch Complex: Fort Greely 5 inch gun. Launch Vehicle: HARP 5-1. G19 - . Nation: USA. Agency: HARP. Apogee: 60 km (37 mi). 1966 March 3 - . 23:00 GMT - . Launch Site: Fort Greely. Launch Complex: Fort Greely 5 inch gun. Launch Vehicle: HARP 5-1. G20 - . Nation: USA. Agency: HARP. Apogee: 20 km (12 mi). 1966 March 4 - . 00:00 GMT - . Launch Site: Fort Greely. Launch Complex: Fort Greely 5 inch gun. Launch Vehicle: HARP 5-1. G21 - . Nation: USA. Agency: HARP. Apogee: 20 km (12 mi). 1966 March 4 - . 00:33 GMT - . Launch Site: Fort Greely. Launch Complex: Fort Greely 5 inch gun. Launch Vehicle: HARP 5-1. G22 - . Nation: USA. Agency: HARP. Apogee: 33 km (20 mi). 1966 March 4 - . 01:30 GMT - . Launch Site: Fort Greely. Launch Complex: Fort Greely 5 inch gun. Launch Vehicle: HARP 5-1. G23 - . Nation: USA. Agency: HARP. Apogee: 39 km (24 mi). 1966 March 4 - . 02:30 GMT - . Launch Site: Fort Greely. Launch Complex: Fort Greely 5 inch gun. Launch Vehicle: HARP 5-1. G24 - . Nation: USA. Agency: HARP. Apogee: 60 km (37 mi). 1966 August 6 - . 21:40 GMT - . Launch Site: Fort Greely. LV Family: Loki. Launch Vehicle: Loki Dart. HE G1 - . Nation: USA. Apogee: 20 km (12 mi). 1966 August 6 - . 23:40 GMT - . Launch Site: Fort Greely. LV Family: Loki. Launch Vehicle: Loki Dart. HE G2 - . Nation: USA. Apogee: 82 km (50 mi). 1966 August 7 - . 09:45 GMT - . Launch Site: Fort Greely. LV Family: Loki. Launch Vehicle: Loki Dart. HE G3 - . Nation: USA. Apogee: 80 km (49 mi). 1966 August 7 - . 11:40 GMT - . Launch Site: Fort Greely. LV Family: Loki. Launch Vehicle: Loki Dart. HE G4 - . Nation: USA. Apogee: 80 km (49 mi). 1966 August 7 - . 21:40 GMT - . Launch Site: Fort Greely. LV Family: Loki. Launch Vehicle: Loki Dart. HE G5 - . Nation: USA. Apogee: 80 km (49 mi). 1966 August 7 - . 23:40 GMT - . Launch Site: Fort Greely. LV Family: Loki. Launch Vehicle: Loki Dart. HE G6 - . Nation: USA. Apogee: 82 km (50 mi). 1966 August 8 - . 09:50 GMT - . Launch Site: Fort Greely. LV Family: Loki. Launch Vehicle: Loki Dart. HE G7 - . Nation: USA. Apogee: 82 km (50 mi). 1966 August 8 - . 11:40 GMT - . Launch Site: Fort Greely. LV Family: Loki. Launch Vehicle: Loki Dart. HE G8 - . Nation: USA. Apogee: 80 km (49 mi). 1966 August 8 - . 21:40 GMT - . Launch Site: Fort Greely. LV Family: Loki. Launch Vehicle: Loki Dart. HE G9 - . Nation: USA. Apogee: 80 km (49 mi). 1966 August 8 - . 23:40 GMT - . Launch Site: Fort Greely. LV Family: Loki. Launch Vehicle: Loki Dart. HE G10 - . Nation: USA. Apogee: 80 km (49 mi). 1966 September 7 - . 09:30 GMT - . Launch Site: Fort Greely. Launch Vehicle: Arcas. PSU-Arcas #14 Ionosphere mission - . Nation: USA. Agency: PSU. Apogee: 85 km (52 mi). 1969 January 3 - . 20:20 GMT - . Launch Site: Fort Greely. LV Family: Deacon. Launch Vehicle: Rocketsonde. Starute,Datasonde - . Nation: USA. Agency: MRN. Apogee: 64 km (39 mi). 1969 January 6 - . 20:52 GMT - . Launch Site: Fort Greely. LV Family: Deacon. Launch Vehicle: Rocketsonde. 1969 January 8 - . 20:10 GMT - . Launch Site: Fort Greely. LV Family: Deacon. Launch Vehicle: Rocketsonde. Starute, Datasonde - . Nation: USA. Agency: MRN. Apogee: 34 km (21 mi). 1969 January 10 - . 20:04 GMT - . Launch Site: Fort Greely. LV Family: Deacon. Launch Vehicle: Rocketsonde. Met Para, Arcasonde - . Nation: USA. Agency: MRN. Apogee: 59 km (36 mi). 1969 January 13 - . 20:00 GMT - . Launch Site: Fort Greely. LV Family: Deacon. Launch Vehicle: Rocketsonde. Starute,Datasonde - . Nation: USA. Agency: MRN. Apogee: 58 km (36 mi). 1969 January 15 - . 20:00 GMT - . Launch Site: Fort Greely. LV Family: Deacon. Launch Vehicle: Rocketsonde. Starute - . Nation: USA. Agency: MRN. Apogee: 55 km (34 mi). 1969 January 15 - . 22:30 GMT - . Launch Site: Fort Greely. LV Family: Deacon. Launch Vehicle: Rocketsonde. Starute,Datasonde - . Nation: USA. Agency: MRN. Apogee: 59 km (36 mi). 1969 January 17 - . 20:00 GMT - . Launch Site: Fort Greely. LV Family: Deacon. Launch Vehicle: Rocketsonde. Starute,Datasonde - . Nation: USA. Agency: MRN. Apogee: 55 km (34 mi). 1969 January 20 - . 20:25 GMT - . Launch Site: Fort Greely. LV Family: Deacon. Launch Vehicle: Rocketsonde. Chaff - . Nation: USA. Agency: MRN. Apogee: 53 km (32 mi). 1969 January 21 - . 21:02 GMT - . Launch Site: Fort Greely. LV Family: Deacon. Launch Vehicle: Rocketsonde. Starute - . Nation: USA. Agency: MRN. Apogee: 47 km (29 mi). 1969 January 21 - . 21:45 GMT - . Launch Site: Fort Greely. LV Family: Deacon. Launch Vehicle: Rocketsonde. Starute, Datasonde - . Nation: USA. Agency: MRN. Apogee: 45 km (27 mi). 1969 January 22 - . 20:00 GMT - . Launch Site: Fort Greely. LV Family: Deacon. Launch Vehicle: Rocketsonde. Met Para, Arcasonde - . Nation: USA. Agency: MRN. Apogee: 69 km (42 mi). 1969 January 23 - . 21:30 GMT - . Launch Site: Fort Greely. LV Family: Deacon. Launch Vehicle: Rocketsonde. Starute - . Nation: USA. Agency: MRN. Apogee: 27 km (16 mi). 1969 January 24 - . 20:00 GMT - . Launch Site: Fort Greely. LV Family: Deacon. Launch Vehicle: Rocketsonde. 1969 January 27 - . 20:01 GMT - . Launch Site: Fort Greely. LV Family: Deacon. Launch Vehicle: Rocketsonde. 1969 January 29 - . 19:44 GMT - . Launch Site: Fort Greely. LV Family: Deacon. Launch Vehicle: Rocketsonde. Starute - . Nation: USA. Agency: MRN. Apogee: 52 km (32 mi). 1969 January 29 - . 20:45 GMT - . Launch Site: Fort Greely. LV Family: Deacon. Launch Vehicle: Rocketsonde. Starute,Datasonde - . Nation: USA. Agency: MRN. Apogee: 68 km (42 mi). 1969 January 30 - . 20:30 GMT - . Launch Site: Fort Greely. LV Family: Deacon. Launch Vehicle: Rocketsonde. Met Para, Arcasonde - . Nation: USA. Agency: MRN. Apogee: 60 km (37 mi). 1969 January 31 - . 20:00 GMT - . Launch Site: Fort Greely. LV Family: Deacon. Launch Vehicle: Rocketsonde. Met Para, Arcasonde - . Nation: USA. Agency: MRN. Apogee: 68 km (42 mi). 1969 February 1 - . 20:00 GMT - . Launch Site: Fort Greely. LV Family: Deacon. Launch Vehicle: Rocketsonde. 1969 February 2 - . 20:17 GMT - . Launch Site: Fort Greely. LV Family: Deacon. Launch Vehicle: Rocketsonde. 1969 February 3 - . 20:00 GMT - . Launch Site: Fort Greely. LV Family: Deacon. Launch Vehicle: Rocketsonde. 1969 February 4 - . 20:00 GMT - . Launch Site: Fort Greely. LV Family: Deacon. Launch Vehicle: Rocketsonde. Met Para, Arcasonde - . Nation: USA. Agency: MRN. Apogee: 71 km (44 mi). 1969 February 5 - . 20:15 GMT - . Launch Site: Fort Greely. LV Family: Deacon. Launch Vehicle: Rocketsonde. Met Para, Arcasonde - . Nation: USA. Agency: MRN. Apogee: 67 km (41 mi). 1969 February 7 - . 20:13 GMT - . Launch Site: Fort Greely. LV Family: Deacon. Launch Vehicle: Rocketsonde. 1969 February 10 - . 20:01 GMT - . Launch Site: Fort Greely. LV Family: Deacon. Launch Vehicle: Rocketsonde. 1969 February 12 - . 21:00 GMT - . Launch Site: Fort Greely. LV Family: Deacon. Launch Vehicle: Rocketsonde. Met Para, Arcasonde - . Nation: USA. Agency: MRN. Apogee: 62 km (38 mi). 1969 February 14 - . 20:00 GMT - . Launch Site: Fort Greely. LV Family: Deacon. Launch Vehicle: Rocketsonde. Met Para, Arcasonde - . Nation: USA. Agency: MRN. Apogee: 65 km (40 mi). 1969 February 17 - . 20:35 GMT - . Launch Site: Fort Greely. LV Family: Deacon. Launch Vehicle: Rocketsonde. Starute,Datasonde - . Nation: USA. Agency: MRN. Apogee: 61 km (37 mi). 1969 February 20 - . 20:30 GMT - . Launch Site: Fort Greely. LV Family: Deacon. Launch Vehicle: Rocketsonde. Starute,Datasonde - . Nation: USA. Agency: MRN. Apogee: 72 km (44 mi). 1969 February 24 - . 20:15 GMT - . Launch Site: Fort Greely. LV Family: Deacon. Launch Vehicle: Rocketsonde. Met Para, Arcasonde - . Nation: USA. Agency: MRN. Apogee: 72 km (44 mi). 1969 February 26 - . 20:00 GMT - . Launch Site: Fort Greely. LV Family: Deacon. Launch Vehicle: Rocketsonde. Starute,Datasonde - . Nation: USA. Agency: MRN. Apogee: 66 km (41 mi). 1969 February 28 - . 20:00 GMT - . Launch Site: Fort Greely. LV Family: Deacon. Launch Vehicle: Rocketsonde. Starute,Datasonde - . Nation: USA. Agency: MRN. Apogee: 67 km (41 mi). 1969 March 3 - . 20:00 GMT - . Launch Site: Fort Greely. LV Family: Deacon. Launch Vehicle: Rocketsonde. Met Para, Arcasonde - . Nation: USA. Agency: MRN. Apogee: 61 km (37 mi). 1969 March 5 - . 20:00 GMT - . Launch Site: Fort Greely. LV Family: Deacon. Launch Vehicle: Rocketsonde. Met Para, Arcasonde - . Nation: USA. Agency: MRN. Apogee: 63 km (39 mi). 1969 March 7 - . 20:02 GMT - . Launch Site: Fort Greely. LV Family: Deacon. Launch Vehicle: Rocketsonde. Met Para, Arcasonde - . Nation: USA. Agency: MRN. Apogee: 64 km (39 mi). 1969 March 10 - . 20:04 GMT - . Launch Site: Fort Greely. LV Family: Deacon. Launch Vehicle: Rocketsonde. Met Para, Arcasonde - . Nation: USA. Agency: MRN. Apogee: 58 km (36 mi). 1969 March 12 - . 20:00 GMT - . Launch Site: Fort Greely. LV Family: Deacon. Launch Vehicle: Rocketsonde. 1969 March 14 - . 20:00 GMT - . Launch Site: Fort Greely. LV Family: Deacon. Launch Vehicle: Rocketsonde. 1969 March 17 - . 20:18 GMT - . Launch Site: Fort Greely. LV Family: Deacon. Launch Vehicle: Rocketsonde. 1969 March 19 - . 20:10 GMT - . Launch Site: Fort Greely. LV Family: Deacon. Launch Vehicle: Rocketsonde. 1969 March 24 - . 20:00 GMT - . Launch Site: Fort Greely. LV Family: Deacon. Launch Vehicle: Rocketsonde. 1969 March 26 - . 20:00 GMT - . Launch Site: Fort Greely. LV Family: Deacon. Launch Vehicle: Rocketsonde. 1969 March 28 - . 20:00 GMT - . Launch Site: Fort Greely. LV Family: Deacon. Launch Vehicle: Rocketsonde. Chaff - . Nation: USA. Agency: MRN. Apogee: 60 km (37 mi). 1969 April 4 - . 20:10 GMT - . Launch Site: Fort Greely. LV Family: Deacon. Launch Vehicle: Rocketsonde. 1969 April 7 - . 20:40 GMT - . Launch Site: Fort Greely. LV Family: Deacon. Launch Vehicle: Rocketsonde. Chaff - . Nation: USA. Agency: MRN. Apogee: 49 km (30 mi). 1969 April 9 - . 20:45 GMT - . Launch Site: Fort Greely. LV Family: Deacon. Launch Vehicle: Rocketsonde. 1969 April 11 - . 20:00 GMT - . Launch Site: Fort Greely. LV Family: Deacon. Launch Vehicle: Rocketsonde. Starute,Datasonde - . Nation: USA. Agency: MRN. Apogee: 63 km (39 mi). 1969 April 14 - . 20:01 GMT - . Launch Site: Fort Greely. LV Family: Deacon. Launch Vehicle: Rocketsonde. 1969 April 18 - . 20:00 GMT - . Launch Site: Fort Greely. LV Family: Deacon. Launch Vehicle: Rocketsonde. 1969 April 21 - . 20:04 GMT - . Launch Site: Fort Greely. LV Family: Deacon. Launch Vehicle: Rocketsonde. Met Para, Arcasonde - . Nation: USA. Agency: MRN. Apogee: 57 km (35 mi). 1969 April 28 - . 21:06 GMT - . Launch Site: Fort Greely. LV Family: Deacon. Launch Vehicle: Rocketsonde. 1969 April 30 - . 19:09 GMT - . Launch Site: Fort Greely. LV Family: Deacon. Launch Vehicle: Rocketsonde. Starute,Datasonde - . Nation: USA. Agency: MRN. Apogee: 60 km (37 mi). 1969 May 2 - . 19:04 GMT - . Launch Site: Fort Greely. LV Family: Deacon. Launch Vehicle: Rocketsonde. Met Para - . Nation: USA. Agency: MRN. Apogee: 58 km (36 mi). 1969 May 5 - . 19:44 GMT - . Launch Site: Fort Greely. LV Family: Deacon. Launch Vehicle: Rocketsonde. 1969 May 8 - . 19:30 GMT - . Launch Site: Fort Greely. LV Family: Deacon. Launch Vehicle: Rocketsonde. 1969 May 9 - . 18:59 GMT - . Launch Site: Fort Greely. LV Family: Deacon. Launch Vehicle: Rocketsonde. 1969 May 12 - . 19:01 GMT - . Launch Site: Fort Greely. LV Family: Deacon. Launch Vehicle: Rocketsonde. 1969 June 6 - . 20:00 GMT - . Launch Site: Fort Greely. LV Family: Deacon. Launch Vehicle: Rocketsonde. 1969 June 18 - . 19:14 GMT - . Launch Site: Fort Greely. LV Family: Deacon. Launch Vehicle: Rocketsonde. 1969 June 20 - . 18:59 GMT - . Launch Site: Fort Greely. LV Family: Deacon. Launch Vehicle: Rocketsonde. 1969 July 2 - . 18:59 GMT - . Launch Site: Fort Greely. LV Family: Deacon. Launch Vehicle: Rocketsonde. Met Para, Arcasonde - . Nation: USA. Agency: MRN. Apogee: 43 km (26 mi). 1969 July 3 - . 19:30 GMT - . Launch Site: Fort Greely. LV Family: Deacon. Launch Vehicle: Rocketsonde. 1969 July 10 - . 19:41 GMT - . Launch Site: Fort Greely. LV Family: Deacon. Launch Vehicle: Rocketsonde. Met Para, Arcasonde - . Nation: USA. Agency: MRN. Apogee: 66 km (41 mi). 1969 July 14 - . 19:02 GMT - . Launch Site: Fort Greely. LV Family: Deacon. Launch Vehicle: Rocketsonde. Starute,Datasonde - . Nation: USA. Agency: MRN. Apogee: 52 km (32 mi). 1969 July 17 - . 19:14 GMT - . Launch Site: Fort Greely. LV Family: Deacon. Launch Vehicle: Rocketsonde. 1969 July 18 - . 18:59 GMT - . Launch Site: Fort Greely. LV Family: Deacon. Launch Vehicle: Rocketsonde. Starute, Datasonde - . Nation: USA. Agency: MRN. Apogee: 48 km (29 mi). 1969 July 24 - . 19:40 GMT - . Launch Site: Fort Greely. LV Family: Deacon. Launch Vehicle: Rocketsonde. 1969 August 22 - . 19:04 GMT - . Launch Site: Fort Greely. LV Family: Deacon. Launch Vehicle: Rocketsonde. Chaff - . Nation: USA. Agency: MRN. Apogee: 58 km (36 mi). 1969 August 25 - . 19:19 GMT - . Launch Site: Fort Greely. LV Family: Deacon. Launch Vehicle: Rocketsonde. Chaff - . Nation: USA. Agency: MRN. Apogee: 57 km (35 mi). 1969 August 27 - . 18:59 GMT - . Launch Site: Fort Greely. LV Family: Deacon. Launch Vehicle: Rocketsonde. 1969 September 5 - . 18:59 GMT - . Launch Site: Fort Greely. LV Family: Deacon. Launch Vehicle: Rocketsonde. Chaff - . Nation: USA. Agency: MRN. Apogee: 61 km (37 mi). 1969 September 8 - . 19:40 GMT - . Launch Site: Fort Greely. LV Family: Deacon. Launch Vehicle: Rocketsonde. 1969 September 12 - . 19:09 GMT - . Launch Site: Fort Greely. LV Family: Deacon. Launch Vehicle: Rocketsonde. 1969 September 17 - . 18:59 GMT - . Launch Site: Fort Greely. LV Family: Deacon. Launch Vehicle: Rocketsonde. 1969 September 24 - . 19:09 GMT - . Launch Site: Fort Greely. LV Family: Deacon. Launch Vehicle: Rocketsonde. Met Para, Arcasonde - . Nation: USA. Agency: MRN. Apogee: 45 km (27 mi). 1969 October 1 - . 19:04 GMT - . Launch Site: Fort Greely. LV Family: Deacon. Launch Vehicle: Rocketsonde. Met Para, Arcasonde - . Nation: USA. Agency: MRN. Apogee: 46 km (28 mi). 1969 October 29 - . 20:00 GMT - . Launch Site: Fort Greely. LV Family: Deacon. Launch Vehicle: Rocketsonde. Met Para, Arcasonde - . Nation: USA. Agency: MRN. Apogee: 48 km (29 mi). 1969 October 31 - . 20:40 GMT - . Launch Site: Fort Greely. LV Family: Deacon. Launch Vehicle: Rocketsonde. Starute, Datasonde - . Nation: USA. Agency: MRN. Apogee: 36 km (22 mi). 1969 November 5 - . 21:59 GMT - . Launch Site: Fort Greely. LV Family: Deacon. Launch Vehicle: Rocketsonde. 1969 November 7 - . 20:02 GMT - . Launch Site: Fort Greely. LV Family: Deacon. Launch Vehicle: Rocketsonde. Starute, Datasonde - . Nation: USA. Agency: MRN. Apogee: 35 km (21 mi). 1969 November 14 - . 20:02 GMT - . Launch Site: Fort Greely. LV Family: Deacon. Launch Vehicle: Rocketsonde. Met Para, Datasonde - . Nation: USA. Agency: MRN. Apogee: 54 km (33 mi). 1969 November 19 - . 23:00 GMT - . Launch Site: Fort Greely. LV Family: Deacon. Launch Vehicle: Rocketsonde. Starute, Datasonde - . Nation: USA. Agency: MRN. Apogee: 53 km (32 mi). 1969 December 18 - . 20:10 GMT - . Launch Site: Fort Greely. LV Family: Deacon. Launch Vehicle: Rocketsonde. Met Para, Datasonde - . Nation: USA. Agency: MRN. Apogee: 45 km (27 mi). 1969 December 22 - . 23:10 GMT - . Launch Site: Fort Greely. LV Family: Deacon. Launch Vehicle: Rocketsonde. Starute, Datasonde - . Nation: USA. Agency: MRN. Apogee: 39 km (24 mi). 1969 December 30 - . 19:44 GMT - . Launch Site: Fort Greely. LV Family: Deacon. Launch Vehicle: Rocketsonde. 1970 January 1 - . 23:00 GMT - . Launch Site: Fort Greely. LV Family: Deacon. Launch Vehicle: Rocketsonde. 1970 January 2 - . 21:59 GMT - . Launch Site: Fort Greely. LV Family: Deacon. Launch Vehicle: Rocketsonde. 1970 January 3 - . 20:01 GMT - . Launch Site: Fort Greely. LV Family: Deacon. Launch Vehicle: Rocketsonde. Met Para, Arcasonde - . Nation: USA. Agency: MRN. Apogee: 55 km (34 mi). 1970 January 4 - . 20:20 GMT - . Launch Site: Fort Greely. LV Family: Deacon. Launch Vehicle: Rocketsonde. Starute, Datasonde - . Nation: USA. Agency: MRN. Apogee: 54 km (33 mi). 1970 January 5 - . 21:59 GMT - . Launch Site: Fort Greely. LV Family: Deacon. Launch Vehicle: Rocketsonde. Starute, Datasonde - . Nation: USA. Agency: MRN. Apogee: 41 km (25 mi). 1970 January 6 - . 21:30 GMT - . Launch Site: Fort Greely. LV Family: Deacon. Launch Vehicle: Rocketsonde. Met Para, Datasonde - . Nation: USA. Agency: MRN. Apogee: 44 km (27 mi). 1970 January 7 - . 22:55 GMT - . Launch Site: Fort Greely. LV Family: Deacon. Launch Vehicle: Rocketsonde. Starute, Datasonde - . Nation: USA. Agency: MRN. Apogee: 42 km (26 mi). 1970 January 9 - . 19:30 GMT - . Launch Site: Fort Greely. LV Family: Deacon. Launch Vehicle: Rocketsonde. 1970 January 15 - . 21:30 GMT - . Launch Site: Fort Greely. LV Family: Deacon. Launch Vehicle: Rocketsonde. Met Para, Datasonde - . Nation: USA. Agency: MRN. Apogee: 63 km (39 mi). 1970 January 16 - . 20:00 GMT - . Launch Site: Fort Greely. LV Family: Deacon. Launch Vehicle: Rocketsonde. Starute,Datasonde - . Nation: USA. Agency: MRN. Apogee: 57 km (35 mi). 1970 January 19 - . 20:00 GMT - . Launch Site: Fort Greely. LV Family: Deacon. Launch Vehicle: Rocketsonde. 1970 January 21 - . 21:30 GMT - . Launch Site: Fort Greely. LV Family: Deacon. Launch Vehicle: Rocketsonde. Density gauge - . Nation: USA. Agency: MRN. Apogee: 50 km (31 mi). 1970 January 23 - . 20:15 GMT - . Launch Site: Fort Greely. LV Family: Deacon. Launch Vehicle: Rocketsonde. Met Para, Arcasonde - . Nation: USA. Agency: MRN. Apogee: 50 km (31 mi). 1970 January 28 - . 20:00 GMT - . Launch Site: Fort Greely. LV Family: Deacon. Launch Vehicle: Rocketsonde. 1970 January 30 - . 20:30 GMT - . Launch Site: Fort Greely. LV Family: Deacon. Launch Vehicle: Rocketsonde. 1970 February 4 - . 23:45 GMT - . Launch Site: Fort Greely. LV Family: Deacon. Launch Vehicle: Rocketsonde. Starute,Datasonde - . Nation: USA. Agency: MRN. Apogee: 54 km (33 mi). 1970 February 9 - . 21:59 GMT - . Launch Site: Fort Greely. LV Family: Deacon. Launch Vehicle: Rocketsonde. Starute,Datasonde - . Nation: USA. Agency: MRN. Apogee: 56 km (34 mi). 1970 February 12 - . 23:30 GMT - . Launch Site: Fort Greely. LV Family: Deacon. Launch Vehicle: Rocketsonde. 1970 February 13 - . 20:30 GMT - . Launch Site: Fort Greely. LV Family: Deacon. Launch Vehicle: Rocketsonde. 1970 February 16 - . 20:00 GMT - . Launch Site: Fort Greely. LV Family: Deacon. Launch Vehicle: Rocketsonde. 1970 February 19 - . 00:14 GMT - . Launch Site: Fort Greely. LV Family: Deacon. Launch Vehicle: Rocketsonde. 1970 February 20 - . 20:00 GMT - . Launch Site: Fort Greely. LV Family: Deacon. Launch Vehicle: Rocketsonde. 1970 February 25 - . 20:00 GMT - . Launch Site: Fort Greely. LV Family: Deacon. Launch Vehicle: Rocketsonde. 1970 February 27 - . 20:00 GMT - . Launch Site: Fort Greely. LV Family: Deacon. Launch Vehicle: Rocketsonde. 1970 March 3 - . 21:41 GMT - . Launch Site: Fort Greely. LV Family: Deacon. Launch Vehicle: Rocketsonde. 1970 March 5 - . 01:14 GMT - . Launch Site: Fort Greely. LV Family: Deacon. Launch Vehicle: Rocketsonde. 1970 March 9 - . 22:14 GMT - . Launch Site: Fort Greely. LV Family: Deacon. Launch Vehicle: Rocketsonde. Starute, Datasonde - . Nation: USA. Agency: MRN. Apogee: 46 km (28 mi). 1970 March 11 - . 23:35 GMT - . Launch Site: Fort Greely. LV Family: Deacon. Launch Vehicle: Rocketsonde. 1970 March 13 - . 20:06 GMT - . Launch Site: Fort Greely. LV Family: Deacon. Launch Vehicle: Rocketsonde. 1970 March 16 - . 21:04 GMT - . Launch Site: Fort Greely. LV Family: Deacon. Launch Vehicle: Rocketsonde. 1970 March 19 - . 19:30 GMT - . Launch Site: Fort Greely. LV Family: Deacon. Launch Vehicle: Rocketsonde. Starute,Datasonde - . Nation: USA. Agency: MRN. Apogee: 50 km (31 mi). 1970 March 24 - . 02:00 GMT - . Launch Site: Fort Greely. LV Family: Deacon. Launch Vehicle: Rocketsonde. 1970 March 25 - . 20:00 GMT - . Launch Site: Fort Greely. LV Family: Deacon. Launch Vehicle: Rocketsonde. Starute, Datasonde - . Nation: USA. Agency: MRN. Apogee: 47 km (29 mi). 1970 March 26 - . 21:00 GMT - . Launch Site: Fort Greely. LV Family: Deacon. Launch Vehicle: Rocketsonde. Starute,Datasonde - . Nation: USA. Agency: MRN. Apogee: 53 km (32 mi). 1970 March 30 - . 20:10 GMT - . Launch Site: Fort Greely. LV Family: Deacon. Launch Vehicle: Rocketsonde. 1970 April 1 - . 20:00 GMT - . Launch Site: Fort Greely. LV Family: Deacon. Launch Vehicle: Rocketsonde. 1970 April 4 - . 02:10 GMT - . Launch Site: Fort Greely. LV Family: Deacon. Launch Vehicle: Rocketsonde. 1970 April 6 - . 20:00 GMT - . Launch Site: Fort Greely. LV Family: Deacon. Launch Vehicle: Rocketsonde. 1970 April 8 - . 21:14 GMT - . Launch Site: Fort Greely. LV Family: Deacon. Launch Vehicle: Rocketsonde. Starute, Datasonde - . Nation: USA. Agency: MRN. Apogee: 49 km (30 mi). 1970 April 8 - . 23:30 GMT - . Launch Site: Fort Greely. LV Family: Deacon. Launch Vehicle: Rocketsonde. 1970 April 9 - . 20:00 GMT - . Launch Site: Fort Greely. LV Family: Deacon. Launch Vehicle: Rocketsonde. 1970 April 11 - . 00:00 GMT - . Launch Site: Fort Greely. LV Family: Deacon. Launch Vehicle: Rocketsonde. 1970 April 13 - . 20:00 GMT - . Launch Site: Fort Greely. LV Family: Deacon. Launch Vehicle: Rocketsonde. 1970 April 14 - . 20:00 GMT - . Launch Site: Fort Greely. LV Family: Deacon. Launch Vehicle: Rocketsonde. 1970 April 15 - . 20:00 GMT - . Launch Site: Fort Greely. LV Family: Deacon. Launch Vehicle: Rocketsonde. 1970 April 17 - . 20:00 GMT - . Launch Site: Fort Greely. LV Family: Deacon. Launch Vehicle: Rocketsonde. 1970 April 21 - . 20:00 GMT - . Launch Site: Fort Greely. LV Family: Deacon. Launch Vehicle: Rocketsonde. 1970 April 22 - . 20:00 GMT - . Launch Site: Fort Greely. LV Family: Deacon. Launch Vehicle: Rocketsonde. Starute,Datasonde - . Nation: USA. Agency: MRN. Apogee: 65 km (40 mi). 1970 April 24 - . 20:02 GMT - . Launch Site: Fort Greely. LV Family: Deacon. Launch Vehicle: Rocketsonde. 1970 April 27 - . 18:59 GMT - . Launch Site: Fort Greely. LV Family: Deacon. Launch Vehicle: Rocketsonde. 1970 April 29 - . 18:59 GMT - . Launch Site: Fort Greely. LV Family: Deacon. Launch Vehicle: Rocketsonde. 1970 April 29 - . 20:30 GMT - . Launch Site: Fort Greely. LV Family: Deacon. Launch Vehicle: Rocketsonde. 1970 May 1 - . 19:03 GMT - . Launch Site: Fort Greely. LV Family: Deacon. Launch Vehicle: Rocketsonde. 1970 May 4 - . 18:59 GMT - . Launch Site: Fort Greely. LV Family: Deacon. Launch Vehicle: Rocketsonde. 1970 May 6 - . 18:59 GMT - . Launch Site: Fort Greely. LV Family: Deacon. Launch Vehicle: Rocketsonde. 1970 May 9 - . 17:30 GMT - . Launch Site: Fort Greely. LV Family: Deacon. Launch Vehicle: Rocketsonde. 1970 May 11 - . 19:01 GMT - . Launch Site: Fort Greely. LV Family: Deacon. Launch Vehicle: Rocketsonde. 1970 May 13 - . 18:59 GMT - . Launch Site: Fort Greely. LV Family: Deacon. Launch Vehicle: Rocketsonde. 1970 May 15 - . 18:59 GMT - . Launch Site: Fort Greely. LV Family: Deacon. Launch Vehicle: Rocketsonde. 1970 May 20 - . 19:44 GMT - . Launch Site: Fort Greely. LV Family: Deacon. Launch Vehicle: Rocketsonde. Starute, Datasonde - . Nation: USA. Agency: MRN. Apogee: 59 km (36 mi). 1970 May 22 - . 01:14 GMT - . Launch Site: Fort Greely. LV Family: Deacon. Launch Vehicle: Rocketsonde. 1970 May 22 - . 18:59 GMT - . Launch Site: Fort Greely. LV Family: Deacon. Launch Vehicle: Rocketsonde. 1970 May 25 - . 19:30 GMT - . Launch Site: Fort Greely. LV Family: Deacon. Launch Vehicle: Rocketsonde. 1970 May 27 - . 18:59 GMT - . Launch Site: Fort Greely. LV Family: Deacon. Launch Vehicle: Rocketsonde. 1970 May 28 - . 18:00 GMT - . Launch Site: Fort Greely. LV Family: Deacon. Launch Vehicle: Rocketsonde. Starute, Datasonde - . Nation: USA. Agency: MRN. Apogee: 57 km (35 mi). 1970 June 1 - . 18:59 GMT - . Launch Site: Fort Greely. LV Family: Deacon. Launch Vehicle: Rocketsonde. Starute, Datasonde - . Nation: USA. Agency: MRN. Apogee: 60 km (37 mi). 1970 June 3 - . 18:59 GMT - . Launch Site: Fort Greely. LV Family: Deacon. Launch Vehicle: Rocketsonde. 1970 June 5 - . 18:59 GMT - . Launch Site: Fort Greely. LV Family: Deacon. Launch Vehicle: Rocketsonde. 1970 June 8 - . 18:59 GMT - . Launch Site: Fort Greely. LV Family: Deacon. Launch Vehicle: Rocketsonde. Starute,Datasonde - . Nation: USA. Agency: MRN. Apogee: 62 km (38 mi). 1970 June 11 - . 18:59 GMT - . Launch Site: Fort Greely. LV Family: Deacon. Launch Vehicle: Rocketsonde. 1970 June 11 - . 20:30 GMT - . Launch Site: Fort Greely. LV Family: Deacon. Launch Vehicle: Rocketsonde. 1970 June 12 - . 18:59 GMT - . Launch Site: Fort Greely. LV Family: Deacon. Launch Vehicle: Rocketsonde. 1970 June 15 - . 18:59 GMT - . Launch Site: Fort Greely. LV Family: Deacon. Launch Vehicle: Rocketsonde. 1970 June 17 - . 18:59 GMT - . Launch Site: Fort Greely. LV Family: Deacon. Launch Vehicle: Rocketsonde. 1970 June 19 - . 20:00 GMT - . Launch Site: Fort Greely. LV Family: Deacon. Launch Vehicle: Rocketsonde. Starute,Datasonde - . Nation: USA. Agency: MRN. Apogee: 51 km (31 mi). 1970 June 23 - . 18:59 GMT - . Launch Site: Fort Greely. LV Family: Deacon. Launch Vehicle: Rocketsonde. 1970 June 24 - . 18:59 GMT - . Launch Site: Fort Greely. LV Family: Deacon. Launch Vehicle: Rocketsonde. 1970 June 26 - . 18:40 GMT - . Launch Site: Fort Greely. LV Family: Deacon. Launch Vehicle: Rocketsonde. 1970 June 29 - . 23:15 GMT - . Launch Site: Fort Greely. LV Family: Deacon. Launch Vehicle: Rocketsonde. 1970 July 1 - . 18:59 GMT - . Launch Site: Fort Greely. LV Family: Deacon. Launch Vehicle: Rocketsonde. 1970 July 2 - . 00:34 GMT - . Launch Site: Fort Greely. LV Family: Deacon. Launch Vehicle: Rocketsonde. 1970 July 2 - . 20:00 GMT - . Launch Site: Fort Greely. LV Family: Deacon. Launch Vehicle: Rocketsonde. 1970 July 6 - . 18:45 GMT - . Launch Site: Fort Greely. LV Family: Deacon. Launch Vehicle: Rocketsonde. 1970 July 8 - . 18:55 GMT - . Launch Site: Fort Greely. LV Family: Deacon. Launch Vehicle: Rocketsonde. 1970 July 10 - . 17:00 GMT - . Launch Site: Fort Greely. LV Family: Deacon. Launch Vehicle: Rocketsonde. 1970 July 13 - . 18:59 GMT - . Launch Site: Fort Greely. LV Family: Deacon. Launch Vehicle: Rocketsonde. 1970 July 15 - . 18:59 GMT - . Launch Site: Fort Greely. LV Family: Deacon. Launch Vehicle: Rocketsonde. 1970 July 21 - . 20:30 GMT - . Launch Site: Fort Greely. LV Family: Deacon. Launch Vehicle: Rocketsonde. 1970 July 22 - . 20:00 GMT - . Launch Site: Fort Greely. LV Family: Deacon. Launch Vehicle: Rocketsonde. 1970 July 24 - . 18:59 GMT - . Launch Site: Fort Greely. LV Family: Deacon. Launch Vehicle: Rocketsonde. 1970 July 27 - . 19:00 GMT - . Launch Site: Fort Greely. LV Family: Deacon. Launch Vehicle: Rocketsonde. 1970 July 29 - . 19:30 GMT - . Launch Site: Fort Greely. LV Family: Deacon. Launch Vehicle: Rocketsonde. 1970 July 31 - . 18:59 GMT - . Launch Site: Fort Greely. LV Family: Deacon. Launch Vehicle: Rocketsonde. 1970 August 3 - . 18:59 GMT - . Launch Site: Fort Greely. LV Family: Deacon. Launch Vehicle: Rocketsonde. 1970 August 5 - . 19:01 GMT - . Launch Site: Fort Greely. LV Family: Deacon. Launch Vehicle: Rocketsonde. 1970 August 7 - . 18:59 GMT - . Launch Site: Fort Greely. LV Family: Deacon. Launch Vehicle: Rocketsonde. 1970 August 10 - . 19:03 GMT - . Launch Site: Fort Greely. LV Family: Deacon. Launch Vehicle: Rocketsonde. 1970 August 12 - . 18:33 GMT - . Launch Site: Fort Greely. LV Family: Deacon. Launch Vehicle: Rocketsonde. 1970 August 14 - . 20:03 GMT - . Launch Site: Fort Greely. LV Family: Deacon. Launch Vehicle: Rocketsonde. 1970 August 17 - . 18:59 GMT - . Launch Site: Fort Greely. LV Family: Deacon. Launch Vehicle: Rocketsonde. 1970 August 19 - . 18:59 GMT - . Launch Site: Fort Greely. LV Family: Deacon. Launch Vehicle: Rocketsonde. 1970 August 19 - . 20:30 GMT - . Launch Site: Fort Greely. LV Family: Deacon. Launch Vehicle: Rocketsonde. 1970 August 27 - . 00:40 GMT - . Launch Site: Fort Greely. LV Family: Deacon. Launch Vehicle: Rocketsonde. 1970 August 27 - . 18:59 GMT - . Launch Site: Fort Greely. LV Family: Deacon. Launch Vehicle: Rocketsonde. 1970 August 28 - . 18:00 GMT - . Launch Site: Fort Greely. LV Family: Deacon. Launch Vehicle: Rocketsonde. 1970 August 31 - . 18:59 GMT - . Launch Site: Fort Greely. LV Family: Deacon. Launch Vehicle: Rocketsonde. 1970 September 2 - . 19:30 GMT - . Launch Site: Fort Greely. LV Family: Deacon. Launch Vehicle: Rocketsonde. Met Para, Datasonde - . Nation: USA. Agency: MRN. Apogee: 56 km (34 mi). 1970 September 2 - . 22:30 GMT - . Launch Site: Fort Greely. LV Family: Deacon. Launch Vehicle: Rocketsonde. 1970 September 4 - . 18:59 GMT - . Launch Site: Fort Greely. LV Family: Deacon. Launch Vehicle: Rocketsonde. Met Para, Datasonde - . Nation: USA. Agency: MRN. Apogee: 52 km (32 mi). 1970 September 8 - . 19:10 GMT - . Launch Site: Fort Greely. LV Family: Deacon. Launch Vehicle: Rocketsonde. Met Para, Datasonde - . Nation: USA. Agency: MRN. Apogee: 62 km (38 mi). 1970 September 10 - . 18:59 GMT - . Launch Site: Fort Greely. LV Family: Deacon. Launch Vehicle: Rocketsonde. 1970 September 11 - . 18:59 GMT - . Launch Site: Fort Greely. LV Family: Deacon. Launch Vehicle: Rocketsonde. Datasonde - . Nation: USA. Agency: MRN. Apogee: 59 km (36 mi). 1970 September 14 - . 23:00 GMT - . Launch Site: Fort Greely. LV Family: Deacon. Launch Vehicle: Rocketsonde. Met Para, Datasonde - . Nation: USA. Agency: MRN. Apogee: 61 km (37 mi). 1970 September 16 - . 19:14 GMT - . Launch Site: Fort Greely. LV Family: Deacon. Launch Vehicle: Rocketsonde. 1970 September 18 - . 19:44 GMT - . Launch Site: Fort Greely. LV Family: Deacon. Launch Vehicle: Rocketsonde. Met Para, Datasonde - . Nation: USA. Agency: MRN. Apogee: 57 km (35 mi). 1970 September 21 - . 19:23 GMT - . Launch Site: Fort Greely. LV Family: Deacon. Launch Vehicle: Rocketsonde. 1970 September 23 - . 20:00 GMT - . Launch Site: Fort Greely. LV Family: Deacon. Launch Vehicle: Rocketsonde. Met Para, Datasonde - . Nation: USA. Agency: MRN. Apogee: 55 km (34 mi). 1970 September 28 - . 18:59 GMT - . Launch Site: Fort Greely. LV Family: Deacon. Launch Vehicle: Rocketsonde. 1970 September 30 - . 20:00 GMT - . Launch Site: Fort Greely. LV Family: Deacon. Launch Vehicle: Rocketsonde. Met Para, Datasonde - . Nation: USA. Agency: MRN. Apogee: 65 km (40 mi). 1970 October 9 - . 18:59 GMT - . Launch Site: Fort Greely. LV Family: Deacon. Launch Vehicle: Rocketsonde. 1970 October 13 - . 18:59 GMT - . Launch Site: Fort Greely. LV Family: Deacon. Launch Vehicle: Rocketsonde. 1970 October 14 - . 20:00 GMT - . Launch Site: Fort Greely. LV Family: Deacon. Launch Vehicle: Rocketsonde. Met Para, Datasonde - . Nation: USA. Agency: MRN. Apogee: 53 km (32 mi). 1970 October 16 - . 19:34 GMT - . Launch Site: Fort Greely. LV Family: Deacon. Launch Vehicle: Rocketsonde. 1970 October 19 - . 20:15 GMT - . Launch Site: Fort Greely. LV Family: Deacon. Launch Vehicle: Rocketsonde. 1970 October 21 - . 18:59 GMT - . Launch Site: Fort Greely. LV Family: Deacon. Launch Vehicle: Rocketsonde. Met Para, Datasonde - . Nation: USA. Agency: MRN. Apogee: 58 km (36 mi). 1970 October 23 - . 18:59 GMT - . Launch Site: Fort Greely. LV Family: Deacon. Launch Vehicle: Rocketsonde. Met Para, Datasonde - . Nation: USA. Agency: MRN. Apogee: 50 km (31 mi). 1970 October 26 - . 20:01 GMT - . Launch Site: Fort Greely. LV Family: Deacon. Launch Vehicle: Rocketsonde. 1970 October 28 - . 20:30 GMT - . Launch Site: Fort Greely. LV Family: Deacon. Launch Vehicle: Rocketsonde. 1970 October 31 - . 20:00 GMT - . Launch Site: Fort Greely. LV Family: Deacon. Launch Vehicle: Rocketsonde. 1970 November 2 - . 20:00 GMT - . Launch Site: Fort Greely. LV Family: Deacon. Launch Vehicle: Rocketsonde. Nation: USA. Agency: MRN. Apogee: 63 km (39 mi). 1970 November 4 - . 20:30 GMT - . Launch Site: Fort Greely. LV Family: Deacon. Launch Vehicle: Rocketsonde. Met Para, Datasonde - . Nation: USA. Agency: MRN. Apogee: 46 km (28 mi). 1970 November 4 - . 21:59 GMT - . Launch Site: Fort Greely. LV Family: Deacon. Launch Vehicle: Rocketsonde. 1970 November 6 - . 20:00 GMT - . Launch Site: Fort Greely. LV Family: Deacon. Launch Vehicle: Rocketsonde. Met Para, Datasonde - . Nation: USA. Agency: MRN. Apogee: 48 km (29 mi). 1970 November 9 - . 20:15 GMT - . Launch Site: Fort Greely. LV Family: Deacon. Launch Vehicle: Rocketsonde. 1970 November 12 - . 21:00 GMT - . Launch Site: Fort Greely. LV Family: Deacon. Launch Vehicle: Rocketsonde. 1970 November 13 - . 20:00 GMT - . Launch Site: Fort Greely. LV Family: Deacon. Launch Vehicle: Rocketsonde. 1970 November 16 - . 19:44 GMT - . Launch Site: Fort Greely. LV Family: Deacon. Launch Vehicle: Rocketsonde. Met Para, Datasonde - . Nation: USA. Agency: MRN. Apogee: 60 km (37 mi). 1970 November 18 - . 20:45 GMT - . Launch Site: Fort Greely. LV Family: Deacon. Launch Vehicle: Rocketsonde. Met Para, Datasonde - . Nation: USA. Agency: MRN. Apogee: 51 km (31 mi). 1970 November 18 - . 23:30 GMT - . Launch Site: Fort Greely. LV Family: Deacon. Launch Vehicle: Rocketsonde. 1970 November 21 - . 20:45 GMT - . Launch Site: Fort Greely. LV Family: Deacon. Launch Vehicle: Rocketsonde. 1970 November 23 - . 20:10 GMT - . Launch Site: Fort Greely. LV Family: Deacon. Launch Vehicle: Rocketsonde. 1970 November 26 - . 00:00 GMT - . Launch Site: Fort Greely. LV Family: Deacon. Launch Vehicle: Rocketsonde. 1970 November 27 - . 23:04 GMT - . Launch Site: Fort Greely. LV Family: Deacon. Launch Vehicle: Rocketsonde. Met Para, Datasonde - . Nation: USA. Agency: MRN. Apogee: 59 km (36 mi). 1970 November 30 - . 21:10 GMT - . Launch Site: Fort Greely. LV Family: Deacon. Launch Vehicle: Rocketsonde. 1970 December 2 - . 21:30 GMT - . Launch Site: Fort Greely. LV Family: Deacon. Launch Vehicle: Rocketsonde. 1970 December 4 - . 23:30 GMT - . Launch Site: Fort Greely. LV Family: Deacon. Launch Vehicle: Rocketsonde. 1970 December 14 - . 23:15 GMT - . Launch Site: Fort Greely. LV Family: Deacon. Launch Vehicle: Rocketsonde. 1970 December 16 - . 21:00 GMT - . Launch Site: Fort Greely. LV Family: Deacon. Launch Vehicle: Rocketsonde. Nation: USA. Agency: MRN. Apogee: 46 km (28 mi). 1970 December 16 - . 23:15 GMT - . Launch Site: Fort Greely. LV Family: Deacon. Launch Vehicle: Rocketsonde. 1970 December 18 - . 21:00 GMT - . Launch Site: Fort Greely. LV Family: Deacon. Launch Vehicle: Rocketsonde. 1970 December 19 - . 18:59 GMT - . Launch Site: Fort Greely. LV Family: Deacon. Launch Vehicle: Rocketsonde. 1970 December 22 - . 19:14 GMT - . Launch Site: Fort Greely. LV Family: Deacon. Launch Vehicle: Rocketsonde. 1970 December 23 - . 00:00 GMT - . Launch Site: Fort Greely. LV Family: Deacon. Launch Vehicle: Rocketsonde. Nation: USA. Agency: MRN. Apogee: 61 km (37 mi). 1970 December 23 - . 19:30 GMT - . Launch Site: Fort Greely. LV Family: Deacon. Launch Vehicle: Rocketsonde. Datasonde - . Nation: USA. Agency: MRN. Apogee: 64 km (39 mi). 1970 December 26 - . 18:59 GMT - . Launch Site: Fort Greely. LV Family: Deacon. Launch Vehicle: Rocketsonde. Met Para, Datasonde - . Nation: USA. Agency: MRN. Apogee: 64 km (39 mi). 1970 December 28 - . 23:30 GMT - . Launch Site: Fort Greely. LV Family: Deacon. Launch Vehicle: Rocketsonde. 1970 December 30 - . 21:14 GMT - . Launch Site: Fort Greely. LV Family: Deacon. Launch Vehicle: Rocketsonde. 1970 December 31 - . 19:30 GMT - . Launch Site: Fort Greely. LV Family: Deacon. Launch Vehicle: Rocketsonde. 1971 April 2 - . 18:59 GMT - . Launch Site: Fort Greely. LV Family: Deacon. Launch Vehicle: Rocketsonde. 1971 April 5 - . 20:15 GMT - . Launch Site: Fort Greely. LV Family: Deacon. Launch Vehicle: Rocketsonde. 1971 April 7 - . 18:59 GMT - . Launch Site: Fort Greely. LV Family: Deacon. Launch Vehicle: Rocketsonde. 1971 April 9 - . 18:59 GMT - . Launch Site: Fort Greely. LV Family: Deacon. Launch Vehicle: Rocketsonde. 1971 April 12 - . 19:14 GMT - . Launch Site: Fort Greely. LV Family: Deacon. Launch Vehicle: Rocketsonde. Starute, Datasonde - . Nation: USA. Agency: MRN. Apogee: 58 km (36 mi). 1971 April 14 - . 20:15 GMT - . Launch Site: Fort Greely. LV Family: Deacon. Launch Vehicle: Rocketsonde. 1971 April 19 - . 18:00 GMT - . Launch Site: Fort Greely. LV Family: Deacon. Launch Vehicle: Rocketsonde. Starute, Datasonde - . Nation: USA. Agency: MRN. Apogee: 56 km (34 mi). 1971 April 21 - . 18:00 GMT - . Launch Site: Fort Greely. LV Family: Deacon. Launch Vehicle: Rocketsonde. Starute, Datasonde - . Nation: USA. Agency: MRN. Apogee: 51 km (31 mi). 1971 April 21 - . 20:00 GMT - . Launch Site: Fort Greely. LV Family: Deacon. Launch Vehicle: Rocketsonde. 1971 April 23 - . 19:14 GMT - . Launch Site: Fort Greely. LV Family: Deacon. Launch Vehicle: Rocketsonde. 1971 April 26 - . 17:00 GMT - . Launch Site: Fort Greely. LV Family: Deacon. Launch Vehicle: Rocketsonde. Starute, Datasonde - . Nation: USA. Agency: MRN. Apogee: 55 km (34 mi). 1971 April 28 - . 18:14 GMT - . Launch Site: Fort Greely. LV Family: Deacon. Launch Vehicle: Rocketsonde. 1971 April 30 - . 17:00 GMT - . Launch Site: Fort Greely. LV Family: Deacon. Launch Vehicle: Rocketsonde. 1971 May 3 - . 20:04 GMT - . Launch Site: Fort Greely. LV Family: Deacon. Launch Vehicle: Rocketsonde. 1971 May 5 - . 20:00 GMT - . Launch Site: Fort Greely. LV Family: Deacon. Launch Vehicle: Rocketsonde. 1971 May 11 - . 22:30 GMT - . Launch Site: Fort Greely. LV Family: Deacon. Launch Vehicle: Rocketsonde. 1971 May 12 - . 20:30 GMT - . Launch Site: Fort Greely. LV Family: Deacon. Launch Vehicle: Rocketsonde. Starute, Datasonde - . Nation: USA. Agency: MRN. Apogee: 62 km (38 mi). 1971 May 14 - . 18:59 GMT - . Launch Site: Fort Greely. LV Family: Deacon. Launch Vehicle: Rocketsonde. 1971 May 17 - . 23:45 GMT - . Launch Site: Fort Greely. LV Family: Deacon. Launch Vehicle: Rocketsonde. 1971 May 19 - . 20:04 GMT - . Launch Site: Fort Greely. LV Family: Deacon. Launch Vehicle: Rocketsonde. 1971 May 21 - . 20:00 GMT - . Launch Site: Fort Greely. LV Family: Deacon. Launch Vehicle: Rocketsonde. 1971 May 24 - . 22:44 GMT - . Launch Site: Fort Greely. LV Family: Deacon. Launch Vehicle: Rocketsonde. 1971 May 26 - . 22:30 GMT - . Launch Site: Fort Greely. LV Family: Deacon. Launch Vehicle: Rocketsonde. 1971 May 28 - . 18:59 GMT - . Launch Site: Fort Greely. LV Family: Deacon. Launch Vehicle: Rocketsonde. 1971 June 3 - . 20:00 GMT - . Launch Site: Fort Greely. LV Family: Deacon. Launch Vehicle: Rocketsonde. 1971 June 4 - . 20:06 GMT - . Launch Site: Fort Greely. LV Family: Deacon. Launch Vehicle: Rocketsonde. 1971 June 7 - . 22:30 GMT - . Launch Site: Fort Greely. LV Family: Deacon. Launch Vehicle: Rocketsonde. 1971 June 9 - . 20:01 GMT - . Launch Site: Fort Greely. LV Family: Deacon. Launch Vehicle: Rocketsonde. 1971 June 11 - . 20:00 GMT - . Launch Site: Fort Greely. LV Family: Deacon. Launch Vehicle: Rocketsonde. 1971 June 14 - . 20:15 GMT - . Launch Site: Fort Greely. LV Family: Deacon. Launch Vehicle: Rocketsonde. Starute, Datasonde - . Nation: USA. Agency: MRN. Apogee: 65 km (40 mi). 1971 August 2 - . 20:01 GMT - . Launch Site: Fort Greely. LV Family: Deacon. Launch Vehicle: Rocketsonde. 1971 August 4 - . 20:15 GMT - . Launch Site: Fort Greely. LV Family: Deacon. Launch Vehicle: Rocketsonde. 1971 August 7 - . 19:49 GMT - . Launch Site: Fort Greely. Launch Vehicle: Arcas. Aeronomy mission - . Nation: USA. Agency: NASA. Apogee: 60 km (37 mi). 1971 August 9 - . 17:40 GMT - . Launch Site: Fort Greely. LV Family: Deacon. Launch Vehicle: Rocketsonde. 1971 August 9 - . 20:12 GMT - . Launch Site: Fort Greely. Launch Vehicle: Arcas. 1971 August 11 - . 20:00 GMT - . Launch Site: Fort Greely. LV Family: Deacon. Launch Vehicle: Rocketsonde. 1971 August 13 - . 18:59 GMT - . Launch Site: Fort Greely. LV Family: Deacon. Launch Vehicle: Rocketsonde. 1971 August 14 - . 19:54 GMT - . Launch Site: Fort Greely. Launch Vehicle: Arcas. 1971 August 16 - . 23:00 GMT - . Launch Site: Fort Greely. LV Family: Deacon. Launch Vehicle: Rocketsonde. 1971 August 18 - . 20:00 GMT - . Launch Site: Fort Greely. LV Family: Deacon. Launch Vehicle: Rocketsonde. 1971 August 20 - . 20:00 GMT - . Launch Site: Fort Greely. LV Family: Deacon. Launch Vehicle: Rocketsonde. 1971 August 23 - . 20:20 GMT - . Launch Site: Fort Greely. LV Family: Deacon. Launch Vehicle: Rocketsonde. 1971 August 25 - . 20:00 GMT - . Launch Site: Fort Greely. LV Family: Deacon. Launch Vehicle: Rocketsonde. 1971 August 27 - . 22:40 GMT - . Launch Site: Fort Greely. LV Family: Deacon. Launch Vehicle: Rocketsonde. 1971 August 30 - . 20:00 GMT - . Launch Site: Fort Greely. LV Family: Deacon. Launch Vehicle: Rocketsonde. 1972 January 3 - . 20:30 GMT - . Launch Site: Fort Greely. LV Family: Deacon. Launch Vehicle: Rocketsonde. 1972 January 5 - . 21:00 GMT - . Launch Site: Fort Greely. LV Family: Deacon. Launch Vehicle: Rocketsonde. 1972 January 5 - . 23:35 GMT - . Launch Site: Fort Greely. LV Family: Deacon. Launch Vehicle: Rocketsonde. 1972 January 6 - . 20:30 GMT - . Launch Site: Fort Greely. LV Family: Deacon. Launch Vehicle: Rocketsonde. 1972 January 7 - . 00:00 GMT - . Launch Site: Fort Greely. LV Family: Deacon. Launch Vehicle: Rocketsonde. 1972 January 18 - . 20:30 GMT - . Launch Site: Fort Greely. LV Family: Deacon. Launch Vehicle: Rocketsonde. 1972 January 21 - . 21:00 GMT - . Launch Site: Fort Greely. LV Family: Deacon. Launch Vehicle: Rocketsonde. 1972 January 25 - . 01:14 GMT - . Launch Site: Fort Greely. LV Family: Deacon. Launch Vehicle: Rocketsonde. 1972 January 27 - . 19:30 GMT - . Launch Site: Fort Greely. LV Family: Deacon. Launch Vehicle: Rocketsonde. 1972 January 28 - . 20:30 GMT - . Launch Site: Fort Greely. LV Family: Deacon. Launch Vehicle: Rocketsonde. 1972 January 31 - . 20:30 GMT - . Launch Site: Fort Greely. LV Family: Deacon. Launch Vehicle: Rocketsonde. 1972 February 5 - . 00:00 GMT - . Launch Site: Fort Greely. LV Family: Deacon. Launch Vehicle: Rocketsonde. 1972 February 7 - . 23:55 GMT - . Launch Site: Fort Greely. LV Family: Deacon. Launch Vehicle: Rocketsonde. 1972 February 9 - . 20:30 GMT - . Launch Site: Fort Greely. LV Family: Deacon. Launch Vehicle: Rocketsonde. 1972 February 16 - . 00:00 GMT - . Launch Site: Fort Greely. LV Family: Deacon. Launch Vehicle: Rocketsonde. 1972 February 16 - . 21:30 GMT - . Launch Site: Fort Greely. LV Family: Deacon. Launch Vehicle: Rocketsonde. 1972 February 18 - . 21:30 GMT - . Launch Site: Fort Greely. LV Family: Deacon. Launch Vehicle: Rocketsonde. 1972 February 23 - . 20:00 GMT - . Launch Site: Fort Greely. LV Family: Deacon. Launch Vehicle: Rocketsonde. 1972 February 25 - . 21:30 GMT - . Launch Site: Fort Greely. LV Family: Deacon. Launch Vehicle: Rocketsonde. 1972 February 28 - . 20:00 GMT - . Launch Site: Fort Greely. LV Family: Deacon. Launch Vehicle: Rocketsonde. 1972 March 1 - . 20:30 GMT - . Launch Site: Fort Greely. LV Family: Deacon. Launch Vehicle: Rocketsonde. 1972 March 3 - . 21:14 GMT - . Launch Site: Fort Greely. LV Family: Deacon. Launch Vehicle: Rocketsonde. 1972 March 6 - . 20:55 GMT - . Launch Site: Fort Greely. LV Family: Deacon. Launch Vehicle: Rocketsonde. 1972 March 15 - . 20:10 GMT - . Launch Site: Fort Greely. LV Family: Deacon. Launch Vehicle: Rocketsonde. 1972 March 17 - . 20:00 GMT - . Launch Site: Fort Greely. LV Family: Deacon. Launch Vehicle: Rocketsonde. 1972 March 20 - . 20:00 GMT - . Launch Site: Fort Greely. LV Family: Deacon. Launch Vehicle: Rocketsonde. 1972 March 22 - . 21:00 GMT - . Launch Site: Fort Greely. LV Family: Deacon. Launch Vehicle: Rocketsonde. 1972 March 24 - . 20:00 GMT - . Launch Site: Fort Greely. LV Family: Deacon. Launch Vehicle: Rocketsonde. 1972 March 27 - . 20:00 GMT - . Launch Site: Fort Greely. LV Family: Deacon. Launch Vehicle: Rocketsonde. 1972 March 29 - . 20:35 GMT - . Launch Site: Fort Greely. LV Family: Deacon. Launch Vehicle: Rocketsonde. 1972 March 29 - . 21:30 GMT - . Launch Site: Fort Greely. LV Family: Deacon. Launch Vehicle: Rocketsonde. 1972 March 30 - . 18:59 GMT - . Launch Site: Fort Greely. LV Family: Deacon. Launch Vehicle: Rocketsonde. 1972 April 3 - . 20:00 GMT - . Launch Site: Fort Greely. LV Family: Deacon. Launch Vehicle: Rocketsonde. 1972 April 10 - . 21:30 GMT - . Launch Site: Fort Greely. LV Family: Deacon. Launch Vehicle: Rocketsonde. 1972 April 14 - . 20:00 GMT - . Launch Site: Fort Greely. LV Family: Deacon. Launch Vehicle: Rocketsonde. 1972 April 19 - . 20:15 GMT - . Launch Site: Fort Greely. LV Family: Deacon. Launch Vehicle: Rocketsonde. 1972 April 19 - . 21:04 GMT - . Launch Site: Fort Greely. LV Family: Deacon. Launch Vehicle: Rocketsonde. 1972 April 20 - . 00:00 GMT - . Launch Site: Fort Greely. LV Family: Deacon. Launch Vehicle: Rocketsonde. 1972 April 21 - . 20:04 GMT - . Launch Site: Fort Greely. LV Family: Deacon. Launch Vehicle: Rocketsonde. 1972 April 24 - . 20:04 GMT - . Launch Site: Fort Greely. LV Family: Deacon. Launch Vehicle: Rocketsonde. 1972 April 27 - . 01:44 GMT - . Launch Site: Fort Greely. LV Family: Deacon. Launch Vehicle: Rocketsonde. 1972 April 28 - . 18:59 GMT - . Launch Site: Fort Greely. LV Family: Deacon. Launch Vehicle: Rocketsonde. Starute, Datasonde - . Nation: USA. Agency: MRN. Apogee: 61 km (37 mi). 1972 May 1 - . 19:34 GMT - . Launch Site: Fort Greely. LV Family: Deacon. Launch Vehicle: Rocketsonde. 1972 May 3 - . 18:59 GMT - . Launch Site: Fort Greely. LV Family: Deacon. Launch Vehicle: Rocketsonde. 1972 May 5 - . 19:00 GMT - . Launch Site: Fort Greely. LV Family: Deacon. Launch Vehicle: Rocketsonde. 1972 May 8 - . 19:44 GMT - . Launch Site: Fort Greely. LV Family: Deacon. Launch Vehicle: Rocketsonde. Starute, Datasonde - . Nation: USA. Agency: MRN. Apogee: 50 km (31 mi). 1972 May 12 - . 18:59 GMT - . Launch Site: Fort Greely. LV Family: Deacon. Launch Vehicle: Rocketsonde. 1972 May 15 - . 19:44 GMT - . Launch Site: Fort Greely. LV Family: Deacon. Launch Vehicle: Rocketsonde. 1972 May 17 - . 20:30 GMT - . Launch Site: Fort Greely. LV Family: Deacon. Launch Vehicle: Rocketsonde. 1972 May 17 - . 23:15 GMT - . Launch Site: Fort Greely. LV Family: Deacon. Launch Vehicle: Rocketsonde. 1972 May 19 - . 18:59 GMT - . Launch Site: Fort Greely. LV Family: Deacon. Launch Vehicle: Rocketsonde. 1972 May 22 - . 18:59 GMT - . Launch Site: Fort Greely. LV Family: Deacon. Launch Vehicle: Rocketsonde. 2004 July 22 - . Launch Site: Fort Greely. Launch Complex: Fort Greely. LV Family: Pegasus. Launch Vehicle: GBI. First GBI Deployment at Fort Greely - . Nation: USA. Agency: MDA. Manufacturer: OSC. The first Ground-Based Interceptor was lowered into a silo at Fort Greely, Alaska. Five additional interceptors were to be deployed in Alaska by the end of September..
2004 November 11 - . Launch Site: Fort Greely. Launch Complex: Fort Greely. LV Family: Pegasus. Launch Vehicle: GBI. GBI Deployment at Fort Greely - . Nation: USA. Agency: MDA. Manufacturer: OSC. The sixth ballistic missile interceptor was installed in its silo at Fort Greely, Alaska, two months behind the mid-year schedule. An additional eight to ten were to be emplaced in 2005, for a total of 14-16..